Manufacturing is in the midst of a period of unprecedented change, as we transition from the industrial age to the information age. The manufacturers that will prove best able to capture value amid this transition will be those who can best manage complexity and embrace flexibility. A new layer of manufacturing software has emerged to answer this call. 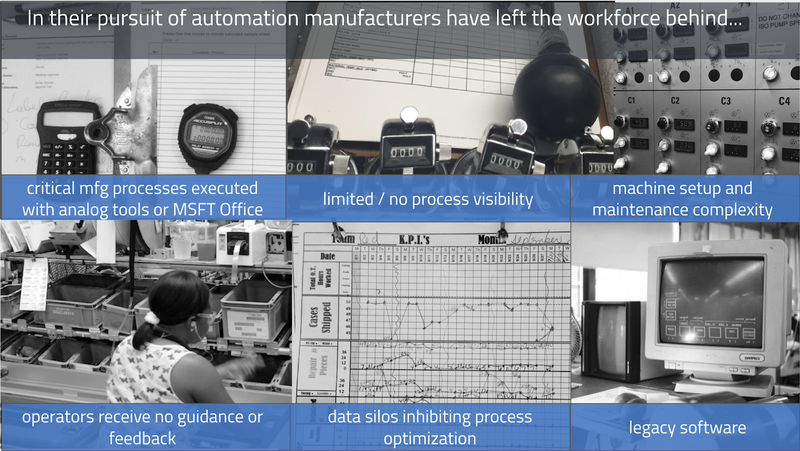 Drawing from insights across hundreds of manufacturing operations, including small and medium-sized businesses and Fortune 500 companies, this post considers the needs of modern manufacturing operations and the role of software in answering these needs. The modern manufacturing operation, where thousands of individual workers interact with global supply chains and automated equipment to produce the products we know and love, is a complex and adaptive system. By definition, this system cannot be fully understood by examining its individual components. A list of equipment, personnel and a process flow chart alone won’t tell you how a specific operation is really running. The reality is that the operation is full of intelligent decision makers: from the associates tasked with performing the work, to the engineers who must ensure its continuous operation. Each of these decision makers constantly absorbs new information from their surroundings and adapts their behaviour to best accomplish their objectives. In this sort of complex system, shifting conditions in the operation can have a non-linear impact on production. Given the sheer complexity of it all, it would be reasonable to assume a host of advanced software underpins this global manufacturing system. After all, the cloud computing era has ushered in a new generation of information technology to help us manage complexity in virtually every other industry. It’s hard to imagine the modern sales professional without Salesforce, or the marketer without Hubspot. How else would they access and organize the data they rely on to perform their duties? And yet, these cloud-based productivity tools remain conspicuously absent from the manufacturing landscape. Take a walk on virtually any shop floor and you’ll see spreadsheets, white boards and paper forms being used to track production processes in the pursuit of efficiency. How have the needs of the world’s largest and arguably most complex industry, where real-time feedback loops and decentralized decision making are imperatives to remaining competitive, been left unaddressed by modern software? In order to appreciate the situation today, it’s worth briefly considering the broader context from which the modern manufacturing machine emerged. How many variables can we solve for? At its core, every manufacturing operation can be distilled to a sequence of actions that each add incremental value to a product. Roles like industrial, process and quality engineers exist to try to find the optimum state that balances throughput with market demand, while incurring as few operational expenses as possible. Historically, manufacturing was viewed as a relatively static system. Manufacturing engineers would attempt to determine the various inputs to the system and achieve the most efficient process. Consider the assembly line. The key insight behind it was in balancing resources evenly over a particular segment of the value chain. 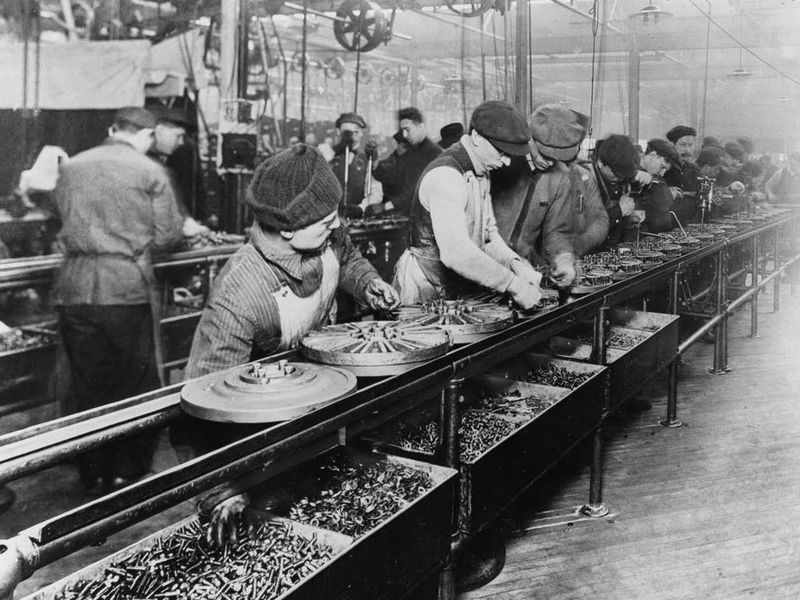 The assembly line allowed for maximum throughput while minimizing the possibility of human error by narrowing the scope of any individual’s work. Each worker did more, faster, better, while simultaneously requiring less training. The assembly line notion of manufacturing works well when the inputs and demands of the system are both static and knowable. The most efficient operations were those that had the best conceived and executed systems in place. The introduction of new technology increased the options available to the manufacturer. With each new technology introduced into the static system, one saw an exponential increase in the total number of possible combinations that had to be considered to achieve the optimal design. Furthermore, the operation was no longer constrained by geography. Supply chains began to span oceans and national borders. Sub-components could be built in-house or sourced from any of a dozen suppliers. In this context, it becomes impossible to conceptualize the system of operations and the associated interdependencies. The unified mechanical system that was the manufacturing value chain was fragmented into various sub-systems and relegated to different sets of stakeholders, each tasked with optimizing their small piece but each possessing only a limited view over how it impacted the system as a whole. To further confound matters, the static view of the manufacturing operation only works when we consider a relatively stable, high-volume, low-mix operation. In reality, manufacturing operations must accommodate shocks to the system and shifting consumer demands. Today’s product line will not run indefinitely. Products, and the systems that build them are constantly adapting. There is no static optimal state of interrelated manufacturing subsystems. Rather, it is a system that is constantly adapting in response to its environment. The optimally efficient target that manufacturers continuously seek shifts daily. It was in this context in the early 1990s that a particular philosophy emerged from an auto manufacturer in Japan. Toyota was the first to embrace the view of a manufacturing operation as a complex adaptive system by realizing that there didn’t exist a single knowable optimal state. Instead, Toyota treated the operation as a dynamic set of nested subsystems whose optimal state could never be achieved but must be continuously sought. To do this, they incorporated feedback loops throughout the system by continuously measuring key performance indicators (KPIs) like throughput, cycle time, rework and scrap rate of the operations. By monitoring and seeking to continuously improve upon these KPIs, one could move the system towards its ever-shifting optimally efficient state. Whenever inefficiency was identified, steps were taken to eliminate it. The goal of process improvement was continuous. Despite the flurry of technological innovation introduced to manufacturing since Toyota launched its now famous production system, the tools leveraged by market leaders to identify, monitor and continuously improve their manufacturing operations remain largely unchanged. A visit to most leading manufacturing shop floors will reveal that paper forms are being used to track defects; stopwatches are used to gauge the appropriate cycle time to complete the various steps in a manual assembly line; manual counters are clicked when a product fails the quality inspection; whiteboards are used to track daily output targets and first pass yield. These manual means of collecting data are time intensive and error prone, yet they are consistently encountered in many of the most technologically advanced operations in the world, some of which produce the very technologies that render paper obsolete in other industries. The need for a layer of connective tissue on the shop floor to manage the capture and dissemination of critical production data is not a novel concept. The generic name attributed to this layer in the manufacturer’s IT stack is a Manufacturing Execution System (MES). Manufacturers often adopt an MES with the hope of increasing the efficiency of their operation and better controlling the production process. The vision sold is one of a centrally-architected optimized state for the manufacturing operation, which is implemented top-down. The fundamental issue with this approach is that these systems attempt to understand and optimize the entirety of the manufacturing operation at the time of design. The resulting complexity is built on a foundation of rigid data models that require a software engineer to understand and navigate. For the complex and dynamic system that is the manufacturing operation, this is a fool’s errand. When these systems are deployed to the shop floor and confront the realities of production, changes to the system are inevitable. These changes have to be managed through the IT team or a third-party software provider and implemented by a software engineer who probably knows very little about manufacturing. The process is slow, painful, and expensive. It also has no end. As the day-to-day operation continues to adapt in response to its shifting environment, more changes must follow. For the manufacturing engineer tasked with keeping the operation running, it is often more effective to revert to paper-based workarounds rather than waiting months to cement a new update to the software solution of choice. One up-and-coming process engineer described having to scale the production of a given line from 250 units per day to over 4,000 per day in less than 12 months. To accomplish this feat, she had to iterate on her process daily. She knew she couldn’t “solve” for the optimal solution. There were too many unknowns and the system was too complicated. Insted, she adopted a strategy of rapid experimentation. She regularly made incremental adjustments, monitored the impact on production and then adjusted her plan accordingly. Attempting to achieve this sort of production gain using the bespoke MES was impossible. Making changes to the system simply took too long and she had to demonstrate double digit production gains each week while relying on the existing resources. When faced with the decision of how to track the impact a particular adjustment would have on production, her only option was to print some forms to record defects and then stand by with a stopwatch to measure how much time the adjustment saved per product produced. She readily acknowledged that these manual tools were time intensive, incomplete, inefficient and error prone. Most of her time was spent collecting data and not actually engineering a better solution. Even so, these tools had one essential attribute that was absolutely critical – she could personally modify and repurpose them in just a few minutes. This story is played out hundreds of times everyday across every major manufacturing operation, as countless manufacturing engineers adapt their process to achieve greater efficiencies. These engineers on the front lines don’t need a perfect software solution that forces adherence to an idealized optimal state. They need an agile set of tools that enable them to embrace change and manage complexity in a decentralized way. A new breed of “no code” app platforms like Tulip is emerging to answer this call. Rather than attempting to design a single solution that prescriptively manages the manufacturer’s day-to-day operations, Tulip simply gives the manufacturing engineers who know their process, a better set of tools to communicate changes to the process and see the impact of those changes in real time. The manufacturing engineers on the front lines build and deploy custom solutions in response to specific problems without writing a line of code. These solutions take the form of manufacturing apps. Here’s how it works. Engineers begin by analyzing their process and identifying a problem that needs to be solved. Perhaps shop floor associates need guidance on a complex custom assembly, or they want to measure the overall effectiveness of a machine, or track the root cause of defects being incurred on a new line. The engineers responsible for these operations build apps with custom logic and content. These apps can then be connected to and incorporate data from machines, sensors, and back-end systems found on the shop floor. The result is that manufacturing engineers have the ability to quickly implement process improvements, see the impact, and adapt their solution based on hard data. These apps can then be deployed as a single point solution, or in parallel by tens of engineers all working on different problems. Modern manufacturing operations are complex. Problems emerge in unexpected ways and minor changes in the system can have non-linear consequences on cost and production. These systems can’t be fully understood by studying their individual parts. But they are full of intelligent decision makers able to constantly absorb new information and continuously improve their solution in response to their shifting environment. A new breed of software emerged to help manage this complexity by better equipping the people in the centre of the manufacturing operation. They give manufacturing engineers the ability to quickly implement solutions to problems and measure their impact. This approach empowers the sort of decentralized but connected problem solving that drives complex adaptive systems to a more efficient state. The shift is already underway. The world is getting more complex by the day and those principles that drove corporate efficiency in the 20th century are ill-suited for the information age. In this new era, the manufacturers that are able to best manage complexity by embracing technologies that encourage decentralized decision making will have a sustained competitive advantage over industry laggards clinging to the 20th century notion of a centrally controlled and executed operation.